A Time And Place from My Leaky Waders on Vimeo. I was able to get out for a few hours this week. I chose a stream that was well-known in the area and considered a class one stream. There are a lot of access points along the stream at it is clear there have been plenty of stream improvement projects. 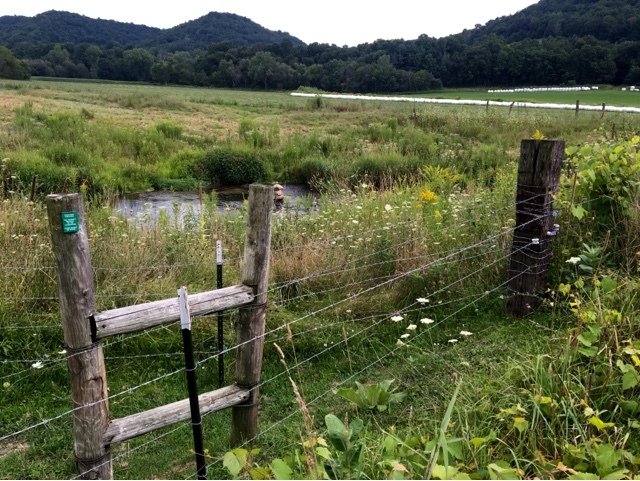 I did notice that one of the landowners updated their fencing which blocked off one of the access points and made a section of the stream a little difficult to pass. 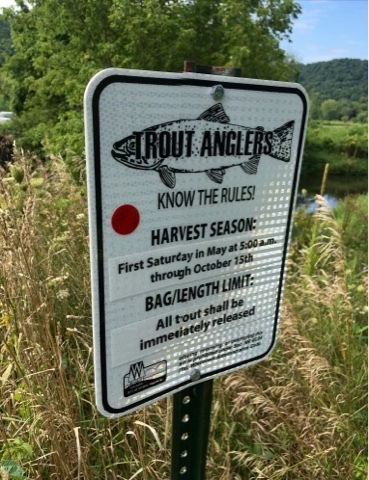 Some of the signs were a little confusing indicating a possible harvest season but at the same time catching release only fishing. 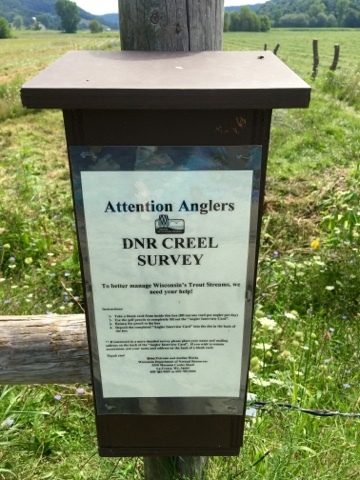 There was also a survey box asking about fish caught and kept. 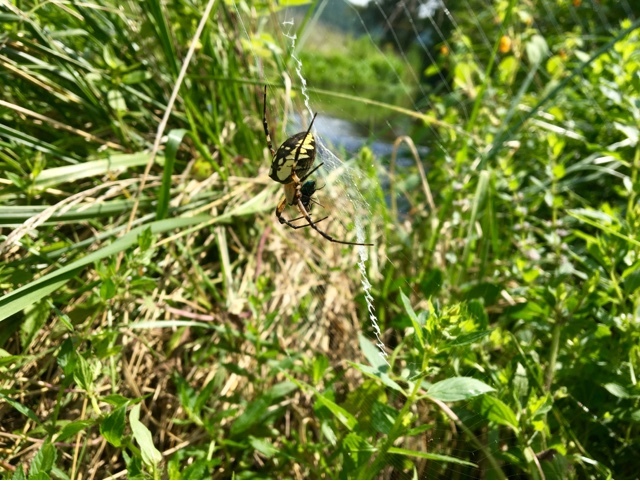 I must say, I didn’t realize the Black and Yellow Argiope lived in Wisconsin. 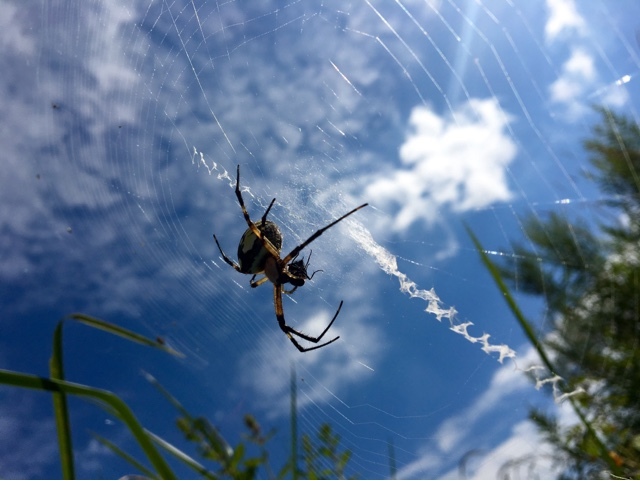 The spiders are harmless but I must say the thought of accidentally walking face first into one of their webs is frightening. I had a lot of luck casting hopper invitations. The grasshoppers are everywhere this time of year and even is the water temperature approached 65°, the fish were still seizing the opportunity to take my fly. It’s a beautiful time to be out on the water. 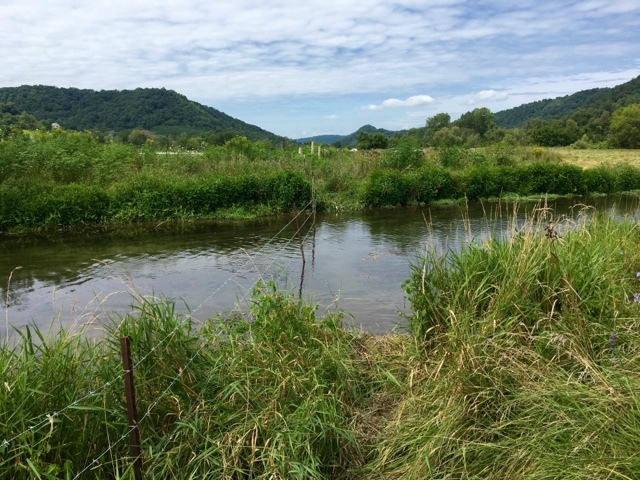 The streams in the driftless area are easy to wet wade. 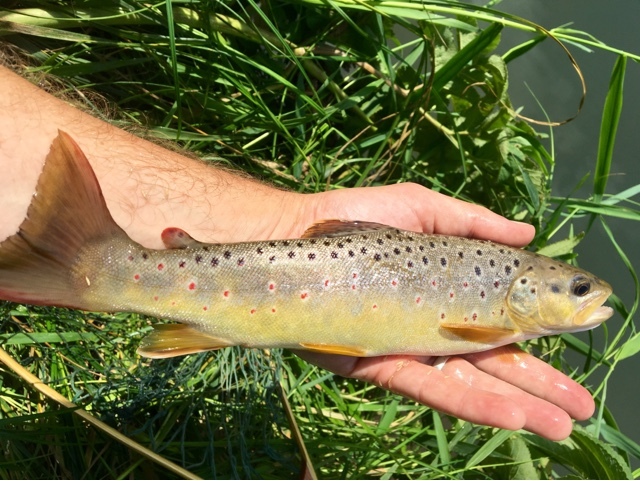 Even before my recent trip to British Columbia which resulted in big fish on streamers and bountiful drive flyfishing, I think I have developed a natural expectation to always find fish each time I go fishing, even if it is a new stream it unfamiliar area. I think the same held true when I went out fishing for a couple hours on Tuesday morning. 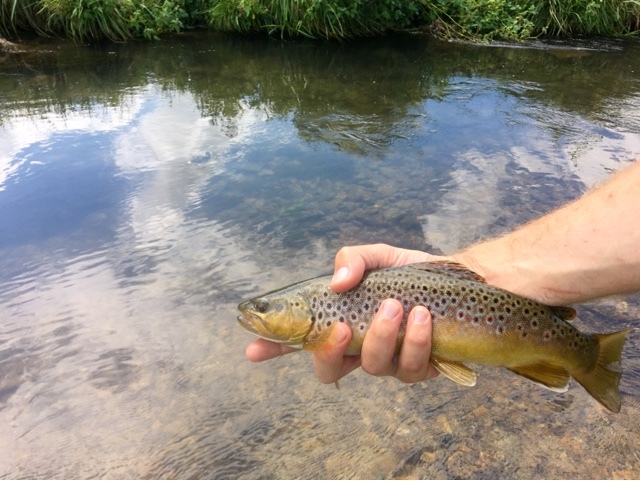 I had a little bit of time to spare forgetting my son to his doctors appointment, so I found a stream on the map that was designated as class one waters meaning that it is capable of sustaining populations of naturally reproducing trout without the need for stocking, and I headed out the door. Much to my chagrin I found myself cornered into a valley where a bridge was out walking my way towards the stream about another 15 miles down the road. 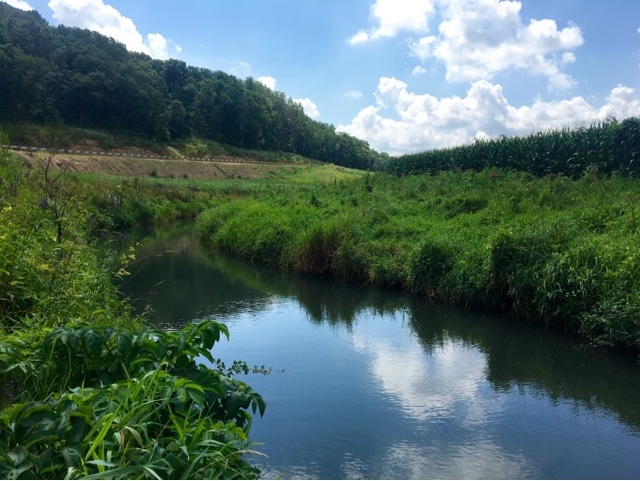 There was a stream that had been meandering along the road as I drove through the cornfield blanketed valleys. It didn’t look like a large stream, but presumably there were fish. I just had trouble finding access points. 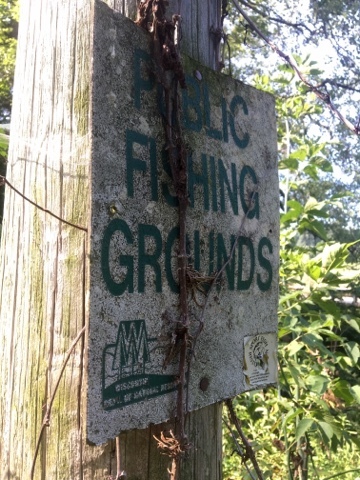 Eventually the stream went under the road and I noticed an old beat up sign on the telephone pole stating “public fishing grounds.” That was the sign I was looking for. I charged around through tall weeds in raspberry tickets to find a stream slightly murky and shallow. The water was cold and there were definite signs of stream improvement projects, but this look like a section of stream that had been forgotten and possibly had a little too much cattle traffic. 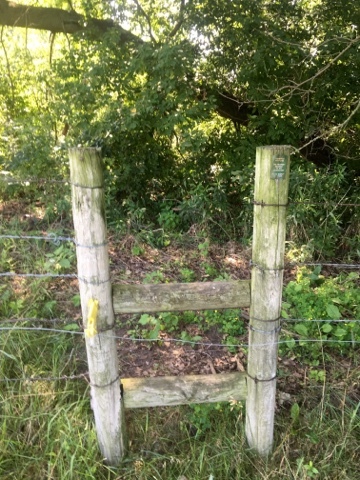 I found another section and walked through the designated access point over the fence and pessimistically explored this text stream through the farm field. There were a few small runs but the depth of the water and pour clarity increased my doubt that I’ll be catching any fish in the stream. I waved to the farmers he drove past smiling. With his grin because he knew my efforts were in vain? As it starts to get hotter and closer to noon, I knew it was time to go. 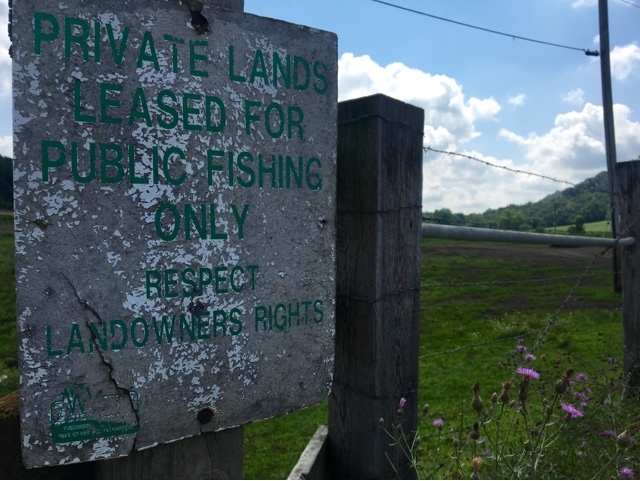 I also started thinking how I don’t really have the right to have such high expectations for myself when heading out fishing on an unknown stream in a location that is, though not foreign to me, still new. 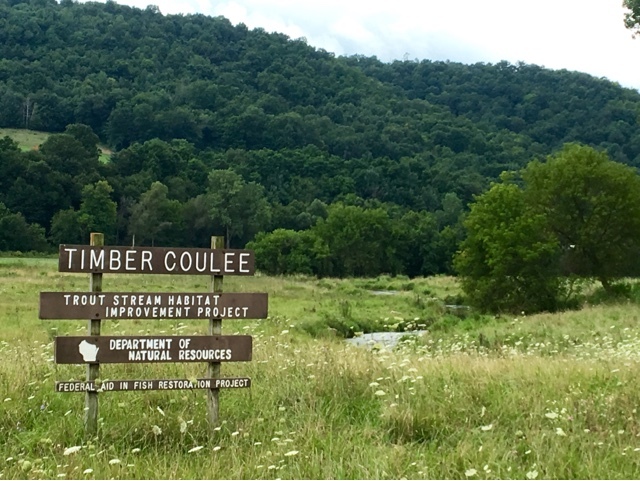 The Wisconsin area of the driftless region is somewhere I’ve never fished before. There are literally, hundreds of miles of streams in the counties that surround me. I will never explore them all. As such, my approach to new streams really must be that of a person seeking exploration and education of new waters as opposed to grip and grin glory. Driving back, I had my tenkara rod and fanny pack in the trunk. I decided to just pull off the road anytime I could see new sections of the stream to see how the depth and clarity changed as I got further downstream. 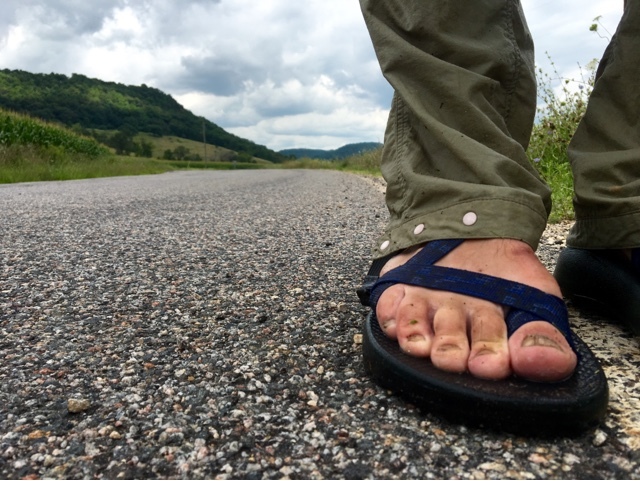 I pulled off at one bridge where there was a small damn creating a large pool downstream and a slow deep section of water upstream. The sun was high and the buzz of grasshoppers getting louder. After about five minutes of watching the water, I saw what may have been a rise. A couple minutes later, with a heightened level of where Ness, I saw what definitely was a fish rise.I grab my gear out of the trunk and started charging through the grass that was easily up to my chest. 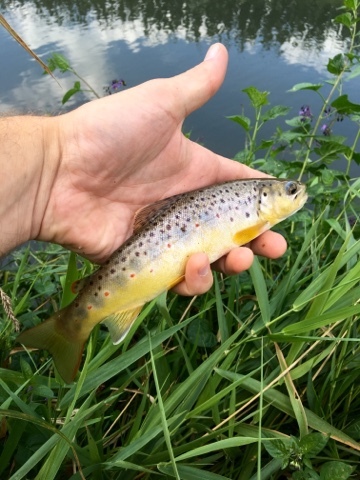 I pulled a respectably small brown trout out of the stream pretty quickly. Man did it feel good to catch my first Wisconsin trout. I watched the stream a little while longer. 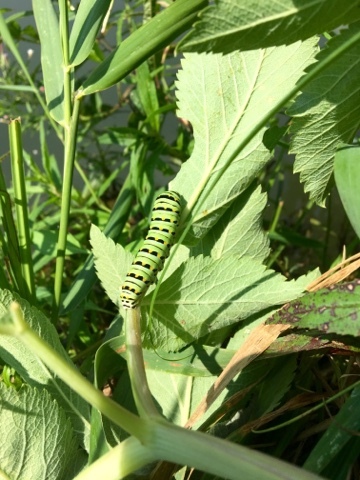 There were ants and Beatles grasshoppers and caterpillars everywhere. This is hands-down terrestrial season. And then I saw a large arise about 30 or 40 feet upstream. I had a mini hopper tied on, my last one. That was then that I got to feel the addictive shockwave that makes fishing with a tenkara rod so fun. 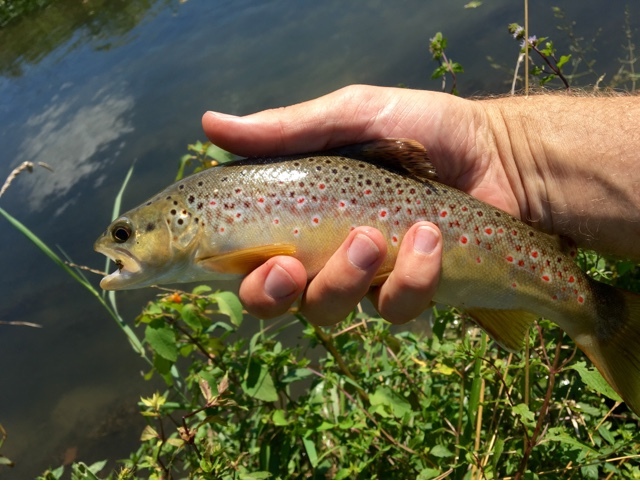 I landed a healthy 12″+ brown. Now, it really was time to go. I had decided I’d beat the odds. I was fortunate to catch one fish on the day like that, but I caught two and one of them was pretty nice fish. I went home and found the stream on the map. 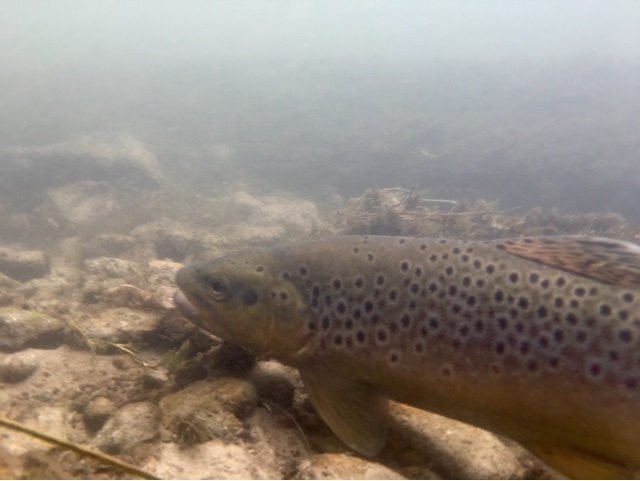 It is classified as a class to stream, meaning there are some naturally reproducing trout but the stream still requires some stocking. The section I had found was very slow and deep water. I imagine this section is a perfect one for naturally reproducing brown trout that like to slowly swim up and sit dry flies. The water is so slow moving that it definitely choirs 4X or 5X tippet. Driving home I decided I was going to make an honest effort to approach each stream with humility. As a Minnesotan transplanted to Wisconsin, I’m a foreigner in a strange land. Therefore, I’ve got to approach these Sconnie streams respectfully. They are a strange breed after all.